Sharing a dorm room means you're going to be living in a space 1/2 the size of a very small room. 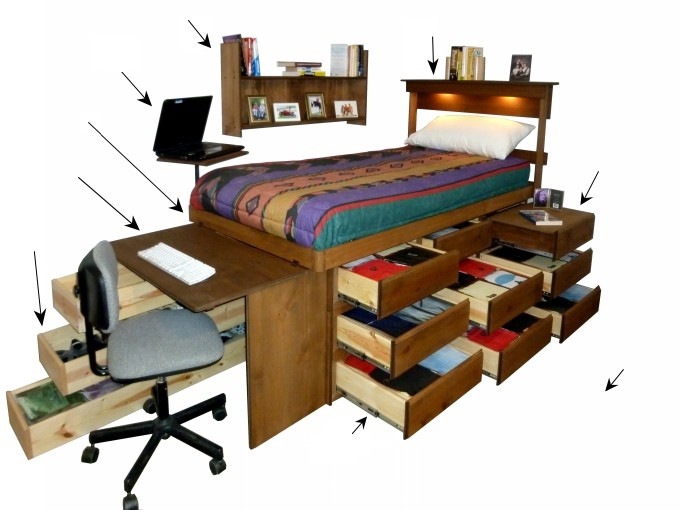 Dorm rooms are incredibly small, so, how and where will you store all your stuff? In storage boxes? Duffel bags? Shoe racks? Laundry bags? Storage bins? Underbed bags and boxes? All of these items take floor space, are inconvenient to use, make the room messy and are a pain to clean around. It's difficult to study in a cluttered room. The Dorm Bed has unique benefits no loft bed or other dorm bed has. It can be converted into different size beds if you move to an off-campus apartment, or after graduation, See examples below. It far more than pays for itself by eliminating the cost of the dressers (about $600 each), and also the cost of bed frames and mattress foundations, which on average are purchased every 7 years at a cost of about $350. These savings can amount to several thousands of dollars in a lifetime, which is far more than the cost of the Dorm Bed. It more than pays for itself in savings! The perfect organizer and ultimate space saver. Solid wood, top quality underbed dresser can have 3, 6 or 9 large (19"W X 17"L X 6"H) storage drawers for clothes, and 1, 2 or 3 giant size end drawers (54'L X 12'W X 8'h) to store "odd stuff": Laundry, books, toys, games, shoes, boots, purses, bedding, sports equipment, etc - all neatly under the bed without using one inch of floor space. Side drawers have full extension, heavy-duty, ball bearing drawer slides, all screwed, tongue and grooved construction. 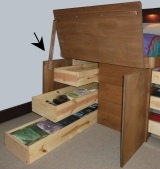 Drawers can open from right or left to fit any room arrangment. Choose "ready to finish" or honey or walnut stain. Assembly required. All hardware included. (1A) 3 Drawer Pine $350. Underbed Dresser Oak $455. Ideal for light storage need and to economize. Stack 1 or 2 addtional levels later, if needed. Headboard, Platform and End Drawer not included. Must order separately. (1B) 6 Drawer Pine $700. Underbed Dresser Oak $910. Sufficient storage for most situations. Stack another level later, if needed. Headboard, Platform and End Drawers not included. Must order separately. Note: Optional Fold-down Desk can not be used with 6 Drawer Dresser. 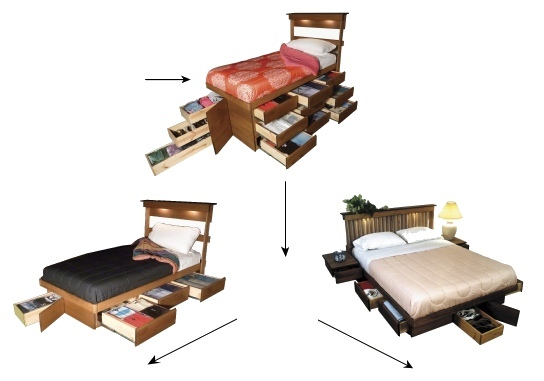 The Ultimate Dorm Bed will store all your odd stuff in its long end drawers. You can have 1, 2 or 3 end drawers. They slide smoothly and easily on full-length drawer guides. They will store your shoes, purses, laundry, sporting equipment, bedding and all your other odd stuff. A door closes over the drawers while in the dresser. The top end drawer (see picture) is perfect for storing all of your desk supplies such as paper, markers, tape, pencils, paper clips, stapler, etc., keeping your room neat and organized. Just pull the top end drawer out about 12" past the desk top for easy access when studying. When finished, just slide the drawer in, and your desk will be as neat as a pin. Will Fit in a Twin Bed? The desk top stays neat and organized because the end drawer stores and organizes all your desk supplies, and your computer table holds your computer up off the desk top. You will always have a neat, uncluttered desk top to work on. It's really difficult to concentrate if you're studying in clutter. How well you learn has much to do with your environment. 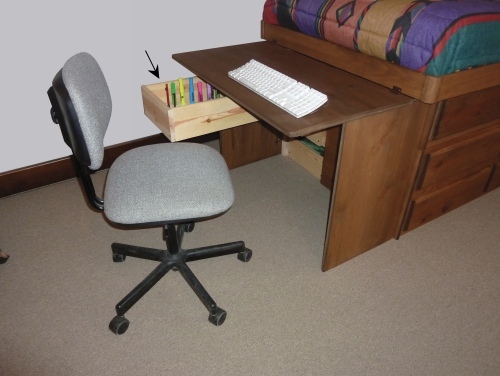 As you can see in picture "A", the desk top can be propped up with the convenient, built-in brace for easy access to the long end drawers. Also, as shown in picture "B", the desk can be folded down flat during those times when you have visitors and need more space. No other desk does that. It takes no floor space! Desk is made of 3/4" solid wood veneer MDF panels. All edges are rounded and smoothly sanded. Top measures 36"L X 20"W. Assembly required. Hardware included. 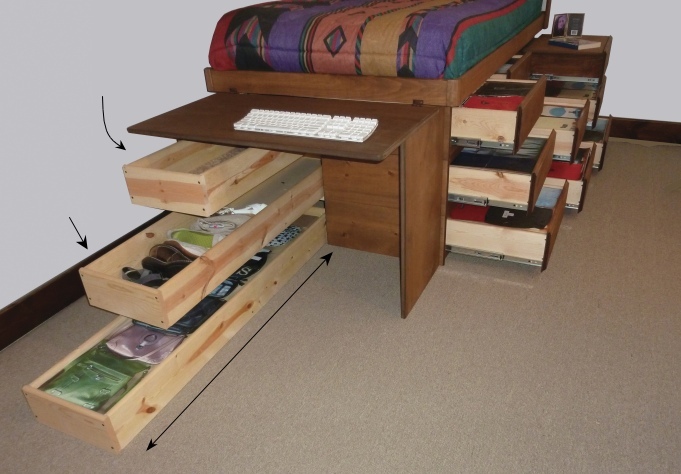 The space-saving platform replaces the box spring. 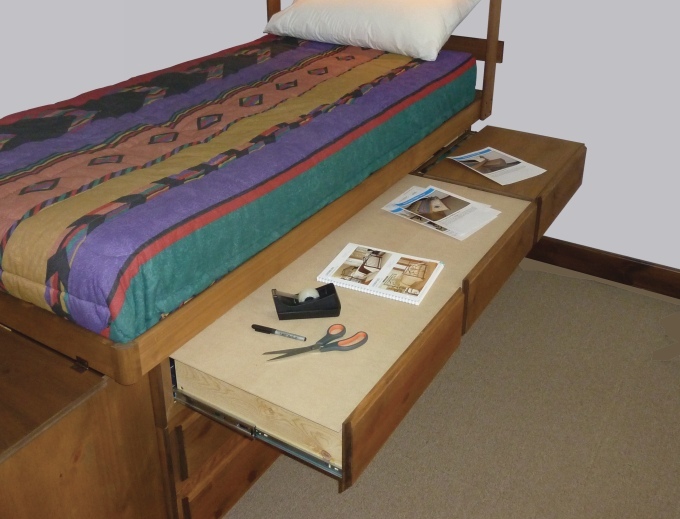 It fastens to the top of the underbed dresser. It supports your mattress and "optional" headboard. The platform bottom is made of 2 pieces of 1/2" plywood or chipboard (your choice). The edges are made of 3/4" clear aspen or oak hardwood. They are rounded, smoothly sanded, and beautifully stained to match the underbed dresser (also available ready to finish). Your bed spread can hang over the platform, or it can be simply tucked down between the mattress and platform (in seconds), exposing the beautiful platform edges. The platform edges also prevent your mattress from moving. 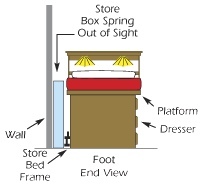 Platform dimensions: 40-1/2" X 80"
NOTE: if box spring and bed frame can not be removed from dorm room, they can be easily stored between the back of the bed and room side wall. This unique, space-saving, rotatable table will support an iPad, computer or TV above your bed and off your desk for easy viewing. 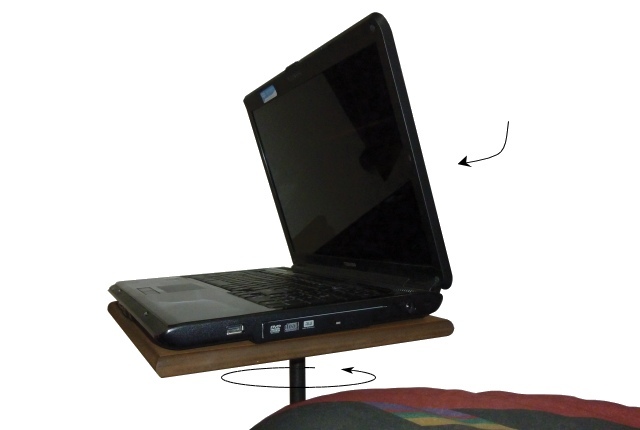 Its strong steel support leg rotates 360 degrees, so that the screen can be viewed from the desk or while laying in bed, or by your visitors. The 3/4" X 12" X 15" table top can support up to a 32" flat screen TV. It doesn't use any floor space! Its strong support brackets attach to the inside of the platform's edges. Therefore, you must order the deluxe platform if ordering computer table. Assembly required, hardware included. This space saving wall book shelf compliments the Ultimate Dorm Bed. It is 4 feet long and 7" deep. It has two shelves. 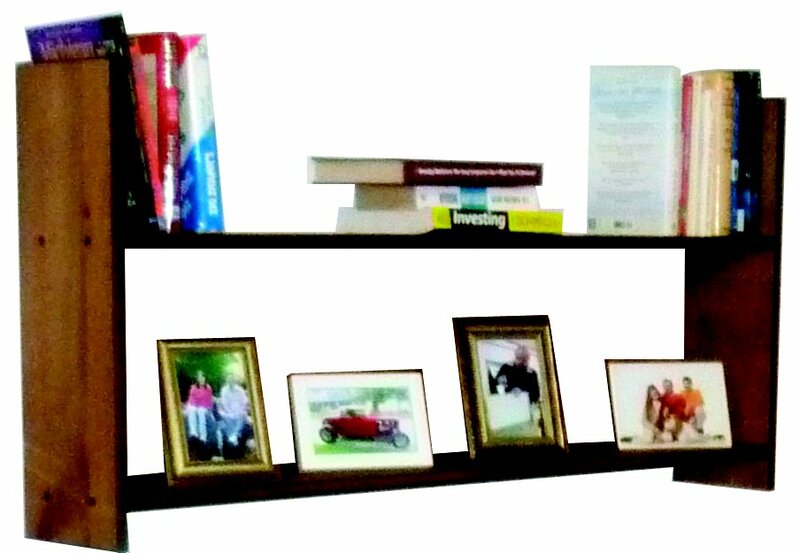 The top shelf with its built-in book ends conveniently stores and organizes all your books out of the way but within easy reach. The bottom shelf, creates a beautiful picture gallery for your favorite photos of friends and family, continually reminding you of home while you're away. Because it's located over the side of your bed, it doesn't use any floor space! 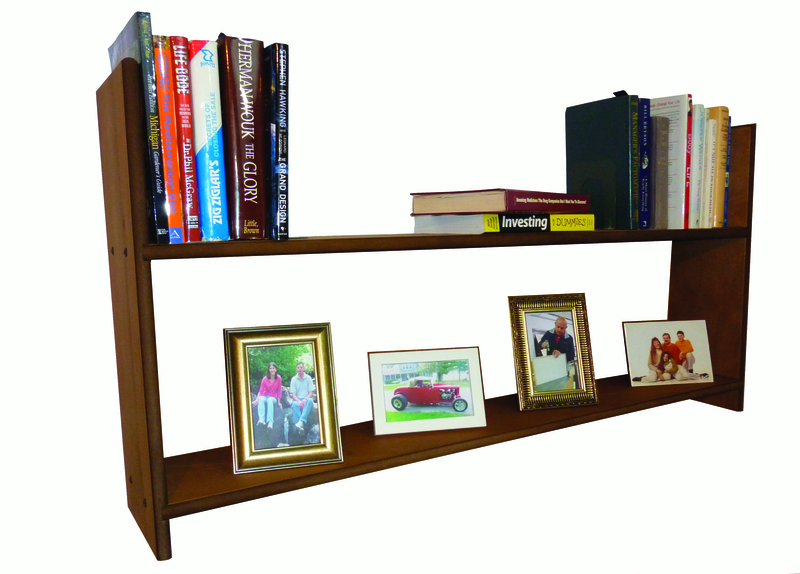 The book shelf is made of solid wood. It is very strong and built to last a lifetime. Assembly required. All hardware included. This space-saving headboard is both beautiful and functional. 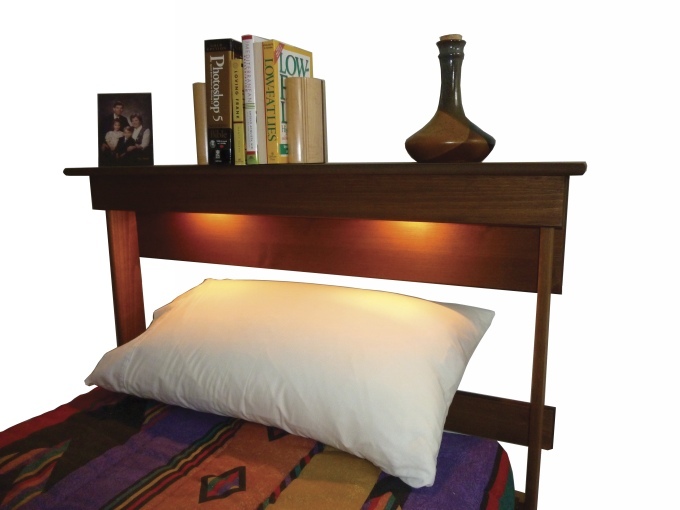 Its bookshelf will hold books, photos and plants, and its indirect lighting will give your bed a warm, soft cozy look. Lights are operated with separate intregal switches. Because the headboard is designed to fit over the bed it uses no floor space! Made of solid wood and wood veneer MDF. Height from floor is 58". Top shelf is 7-1/2" W X 46"L Assembly required. Hardware included. Optional, inexpensive, space-saving project board can create a temporary 6 foot long table for laying out projects that require extra space. To set up the table, two dresser drawers are simply pulled out, then the project board is positioned on the drawers to produce a very solid table top. The project board, when not in use, is simply folded and stored out of sight at the head end of the bed. Made of strong hardboard 1/8" X 23" X 48". Uses no floor space! 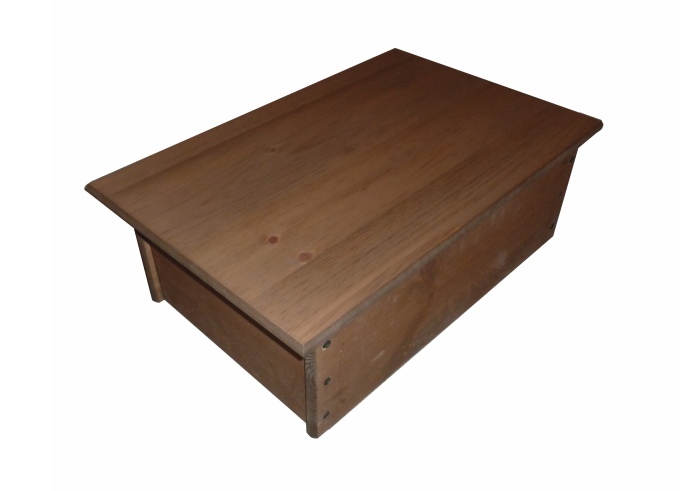 This 3/4" X 16" X 24" space-saving wood veneer MDF table top is strong, functional, convenient and inexpensive. The table is created by simply pulling out any dresser drawer and covering it with the beautifully stained table top. 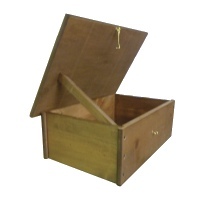 The drawer is perfect for storing your cosmetics, jewelery and personal items. The table will hold a beautiful plant, a picture, your glasses, a book you're reading, a box of tissues, your clock, a candy dish, etc. The table top (with its things on it) is simply lifted up and set on the bed in seconds for easy drawer access. 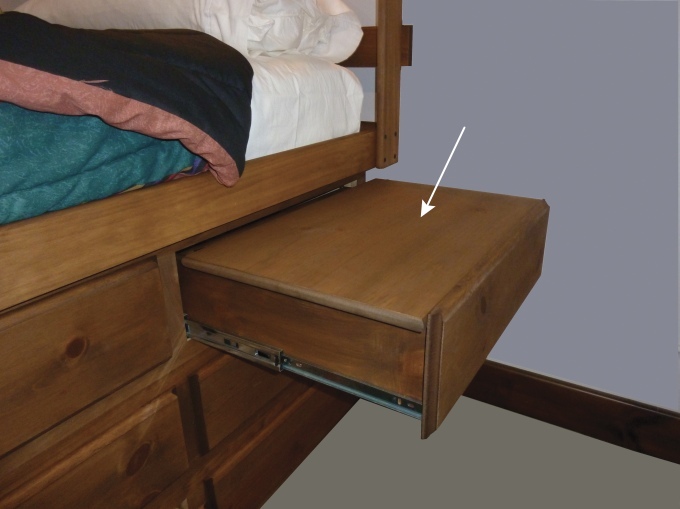 If you have visitors and need more space, the drawer can be closed after simply removing and storing the table top out of sight at the head end of the bed. Table uses no floor space! NOTE: Bed side table also available. For some, the Dorm Bed may be a little too high. When that's the case, a matching step stool solves the problem. It also serves as a large, convenient storage container. An adjustable brace supports the cover while loading. 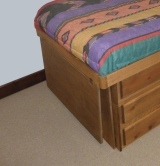 When not in use, the step stool can be simply stood on its side and placed under the bed side table, out of the way. Stool sides are made of 3/4" solid wood. Top is made of 3/4" veneer MDF. Overall dimension: 24"L X 16"W X 8"H. Assembly required. Hardware included. Your uncluttered desk holds only your computer keyboard, leaving lots of room for writing. The pull-out end drawer holds all your desk supplies right at your fingertips. The rotating computer table holds your computer up off the desk and allows it to be perfectly positioned for viewing. 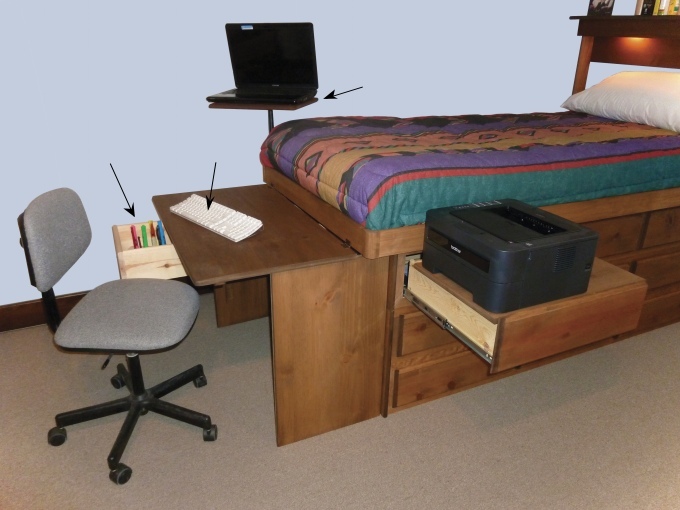 The underbed dresser drawer doubles as a printer table, holding your printer within easy reach. Everything is neat, clean, organized and convenient, creating the ultimate studying environment.